COJECO Presents: Jewish Tour Series. 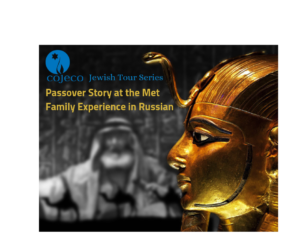 As Pesach approaches, we invite families to the Metropolitan Museum of Arts for a unique tour for parents and children ages 7-11, Passover Story at the Met – Family Experience. Yigal Kotler, a historian and COJECO Director of Jewish Education, will lead parents through the Egyptian wing exploring the role of the grand civilization of Egypt in ancient Jewish history and taking a fresh look at the Passover story based on numerous museum exhibits. At the same time, Asya Gribov, an outstanding museum educator and community convener, will lead an interactive, hands-on exploration of the fascinating history, beliefs, and culture of Ancient Egypt as they pertain to the Jewish story of Passover for the children. COJECO (Council of Jewish Émigré Community Organizations) is the central hub of the Russian-speaking Jewish community in the New York tri-state area. We are the central hub for the Russian-speaking Jewish community in New York tri-state area. Our mission is to convene and connect the Russian-speaking Jewish community to build on our heritage through collaborative leadership, innovative engagement, Jewish education, and community capacity building.